Marlboro beat previously unbeaten Ardsley, 27-19, to reach the regional finals. 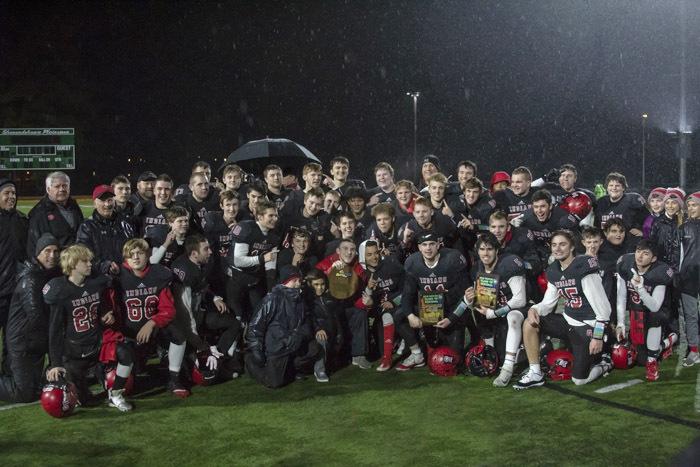 The Indians won the school’s first state title in 2016, and lost last year in the semifinals, 20-7, to Pleasantville. They have reached the state semifinals three straight years. 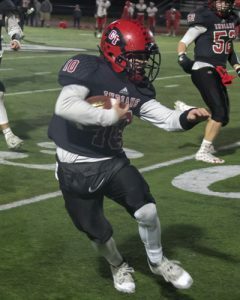 Saturday’s game will not be telecast, but it will be live-streamed online at www.nfhsnetwork.com, with a $9.99 monthly subscription. 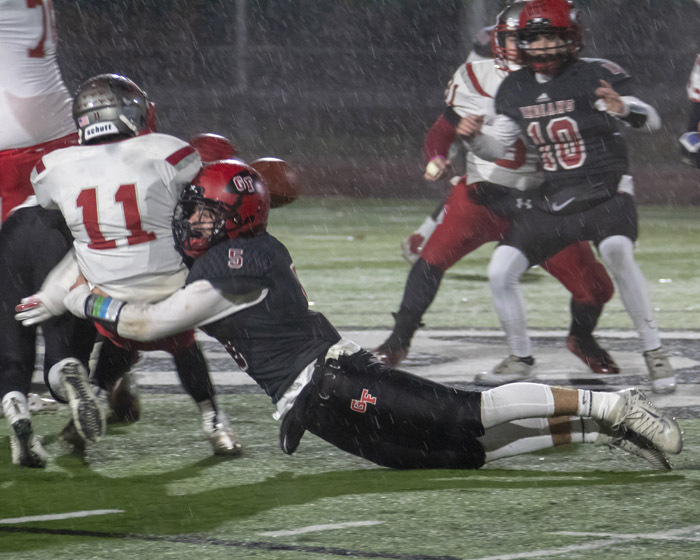 At stake is a berth in the Class B state championship game at the Carrier Dome in Syracuse Saturday, Nov. 24, at noon against either 2017 Class C 11-0 champion Skaneateles (Section III), or 11-0 Batavia (Section V). Coach Pat Lilac’s Indians have lost only two games, both to Class A schools. They fell to Queensbury, 48-34, Sept. 22, and to Burnt Hills, 55-27, Oct. 6. Burnt Hills plays in the ‘A’ state semifinals Friday night against Cornwall. Since that loss to Burnt Hills, the Indians have rolled, outscoring their opponents, 157-13, in four playoff games. 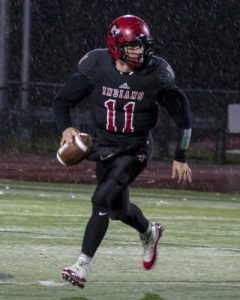 Key players like two-way captain Kyle Vachon have gotten healthy, and the offense, led bystandout quarterback and Syracuse University basketball recruit Joseph Girard III, is explosive and dangerous. 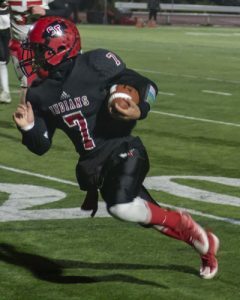 The Indians are led by five captains: Seniors Joseph Girard III (the school’s all-time leading passer who has thrown for 2,458 yards and 31 touchdowns this season), top receiver Trent Girard, lineman Kyle Vachon and injured wide receiver Noah Balcom; and junior all-around standout David Barclay. Glens Falls is not deep, but is versatile at key positions. The Indians have tremendous speed at the skill positions, nimble and powerful linemen up front, and crushing tacklers like Vachon, Barclay and Class B North Division co-defensive players of the year Thompson Collins and Nick Danahy on defense. Another key is “total team speed,” Girard said. “This is the most athletic offensive line we’ve had in my time here, and maybe ever. They make it a lot easier on the skill guys and they make my job a lot easier, especially if I’m scrambling around a lot. Like Vachon, Coach Lilac talks of the team’s mental fortitude. “I have been impressed with the resiliency and toughness that they have shown. We’ve had a couple of kids go down with pretty significant injuries and the next guys up have played well. Coach Lilac said “Marlboro is a really blue-collar type of team. They do run a spread offense, but they have a quarterback [Sam Mongelli] who is very athletic and a great runner, and a really tough tailback [Ameer Williams]. And they seem to be very good on the offensive and defensive lines. Copyright © 2018 Lone Oak Publishing Co., Inc. All Rights Reserved.